I did a series of hourly tests and I noticed something which I found strange. Speeds measured when sending at smaller sizes (256 kB) almost invariably measures slow speeds (averaging 20Kbps). That would be a first. What happens with a 512 kB download test? I was just looking at your results before you posted, thinking... geeze, going off his worst result... it would take this guy 85 minutes to download a 5 MB file. What happens with a 512 kB download test, 10 MB download test or 20 MB download test? Do those test around the same time. No need to post the results just tell me when you're done. I tried to do download tests with manual sizes and testmy.net proceeded to tests from 512 up to the highest. However the logged results did not include 512. I tried to do it thru the links you provided, still the same. You're fast enough right now that it wants to force a large size on you. We can override that... but I feel like we got the information we needed out of those tests. You're in the Philippines, right? Have you tried testing against the server in China? Select other speed test servers. Can you also run another 256 kB download test? If it gives you a super low score again run the 20 MB test above. Have you been running into this while running the Auto Test only or does it do this all of the time with the 256 kB block? I think what's happening is that you're having a very slow start, followed up by much faster speed. When it's spread over a much longer test the pause at the beginning has less affect on the result. I assume that you're seeing a pause of some kind before the test rockets off... right? That's what it's supposed to do if your connection is fast enough. If it allowed you to test with only 512 kB when you have, say, 20 Mbps... the end result would be far from an accurate picture of the connections true capability. TMN's seeing that you're too fast for that size so it's forwarding you on to what it believes is a more appropriate size. tried with Server in HK and at 256 as instructed. I only run auto tests and on fire and forget mode, ie i set the the frequency usually every hour for the next 24 hours. I'm not sure about the PAUSE. I have not configured any. Like I said, it's fire and forget. So I only noticed it when I tabulated and analyzed the results. But it seems that I have the high speeds but TMN is just reporting the 20Kbps at 256MB as the table shows because of the way the test works? So you are using the auto test. Have you ever been at the computer when this happened? It's reporting the speed that it experiences. If your result is 20 Kbps on a 256 kB test... it had to take over 100 seconds to load to log a result that way. The programming is straight forward and doesn't work any other way. I think you're having an issue during those times or your bandwidth is in use... that would definitely cause that to happen. Like if you're downloading something, then the auto test pops off... the end test result will be minus the speed of any transfers in process. If you do find for some reason that you have issues with the 256 kB test you can always manually select your test size. Selecting 'nfw' checkbox on the Auto test will force it to not forward you... there are still some minimum requirements. Certain circumstances will always force a forward to a larger test. Sorry for just replying. Was away from computer. QUESTION: Why does the table show multiple tests with multiple sizes even when (a) I have set nfw and (b) text results show tests size to be 5MB and consistent with parameters? PS. Will post table results after 24 hours. Your bandwidth to China appears to be degraded. Switch to Dallas or California. Also change the minimum to 10 MB download no minimum upload. We'll let the upload auto resize. You first want to be selected on the server that's giving you a favorable result. If you're getting better results against a server that's further away... you should definitely test against the further server. Unless your goal is to to test to mainland China because you visit a lot of sites or servers hosted there. The servers in California are about 3 times further away from you but you're getting better results from there. Traffic to China could be slower for a number of reasons. Part of which may be the government. Do an extended test against China as well, it's good information to know. I just think that for the test you're really trying to conduct, it may be better to test against the server that you've been able to achieve the highest results from. Of course soon after you post two runs that look like this. ... that's more like it. But the hours when your slow, you're really slow. "Your bandwidth to China appears to be degraded. Switch to Dallas or California..." and "You first want to be selected on the server that's giving you a favorable result. If you're getting better results against a server that's further away... you should definitely test against the further server. Unless your goal is to to test to mainland China because you visit a lot of sites or servers hosted there. The servers in California are about 3 times further away from you but you're getting better results from there. Traffic to China could be slower for a number of reasons. Part of which may be the government." I was only doing this because of your earlier recommendation to change my servers to china for where it was originally which was calfornia. My aim is not to test to mainland China but to make my ISP honest. So whichever server it is that would reflect this which I assume to be where my normal traffic is then I'll use that server. Am I correct in this assumption? Also change the minimum to 10 MB download no minimum upload. We'll let the upload auto resize. If I do autotest on both DL and UL, I can set minimums on each but I can only set NFW on both. So do you mean to set DL min size = 10MB, UL min size = not specified and NFW = YES? 1. Opposite to what I experienced before, this test run showed that DL tests with smaller sizes (average of 140MB) shot up to 42Mbps (which is way beyond ISP speed for my plan of 20Mbps) compared to 256MB/20Kbps before. Interesting. You can see a rough correlation here. (https://www.evernote.com/l/AAngLKFM6wBNII4wWIY2JWqES3f7OHwztqM) Why is this? 2. Why is it that despite setting size = 5MB, TMN still tests at these smaller sizes? 3. The other interesting result is that UL was the opposite to DL: The smaller the size the slower the speeds. https://www.evernote.com/l/AAkZT4eKtQBHJ5RGBzBq8F_pGy3DsK5eEdM. Why is this? Anyways, use those results whereever it is applicable. I will do another 24 hour run with your new recommendations and share results as per usual when done. Here's your Hong Kong results for other people reading this. Your link is only 20 Mbps? You were getting nearly 50 Mbps for about 7 hours. Nice and steady, looks legit to me. Knowing how TMN works and it's random nature, especially in the linear test you performed, I trust those results 100%. Somehow, you were faster during that period. At least to Hong Kong. You can only select NFW for both but when you don't select a minimum size for upload it will auto size the test. I can see where NFW needs improvement in that situation, I'll make sure that gets an update soon. I trust those results 100%. I trust your results and I have to say that I'm so grateful for this tool. It is the most comprehensive tool out there. The problem is the Telco (or ISP). They will always point out to some other reason but not them when there's degradation of speeds or when they are not giving the speeds that they have marketed and what customers are paying for. It's the main reason I'm trying to understand how TMN works (I'm just a noobie right now.) The clearer I can explain to them the results and the more variables we can put as "control" the less reasons they will have to point the finger to something else. Good work guys! And thanks for the patience as I try to understand TMN. As promised, I will update this post with the results of the latest 24-hour run which should finish in 5 hours. My ISP told me they only guarantee "local loop." Is there a way I can test the "local loop" using TMN? Do you have access to a larger image on their server? 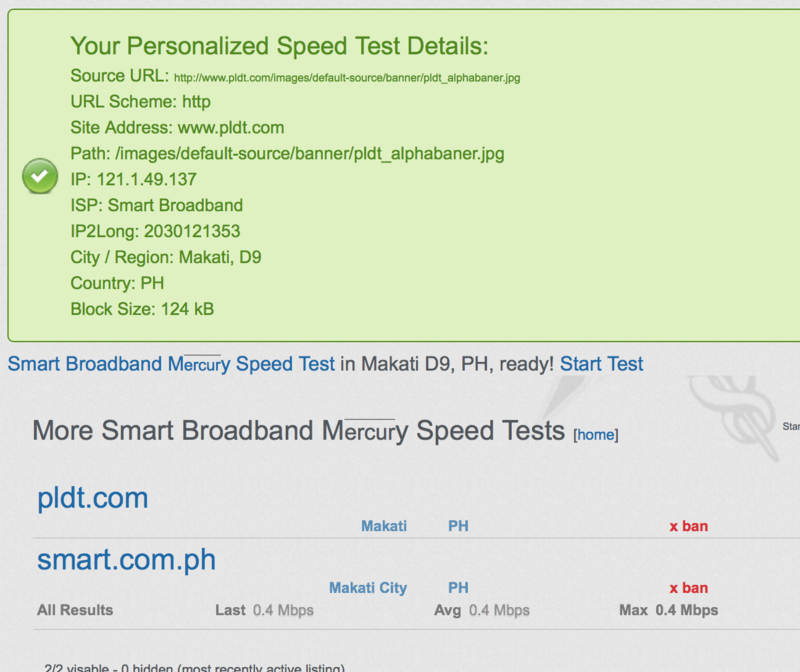 I just created the pldt.com test. Used http://tools.pingdom.com to parse http://pldt.com for an image at least 120kB (seems to be a good all around size). Then go to https://testmy.net/mercury and paste the image URL. TestMy.net will make a test out of the source image, so now you have a test that's testing against an image that's actually on one of their servers. After creating that test it showed me another one that someone else had already created. Right now you can't set those tests as default so you can't use them with the auto test. If you really need to use it with the auto test right now I can take the time and make it work that way for you. It will take a few modifications. Keep in mind that the progress bar for Mercury tests is not always as fluid as the other tests here. The information will download as it would if it were loading on their website. Mercury tests are multithreaded and are limited to the output of the host server. When I test against those I get a fraction of my normal speed 1.7 Mbps (plot.com) and 9.9 Mbps (smart.com.ph) but if you're within that network you may see better speed. What use is it to you if they only guarantee speed within their network? You did order Internet service, right?